An eastern fox squirrel strips eats bark that it has stripped from a tree. It had already pulled off quite a bit of the bark near its perch. 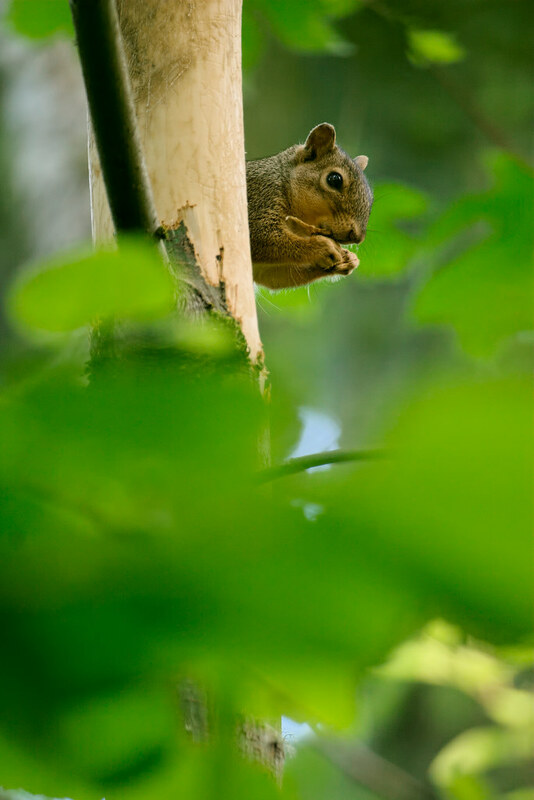 The eastern fox squirrel is not native to this area but is commonly seen in the Portland metro area. 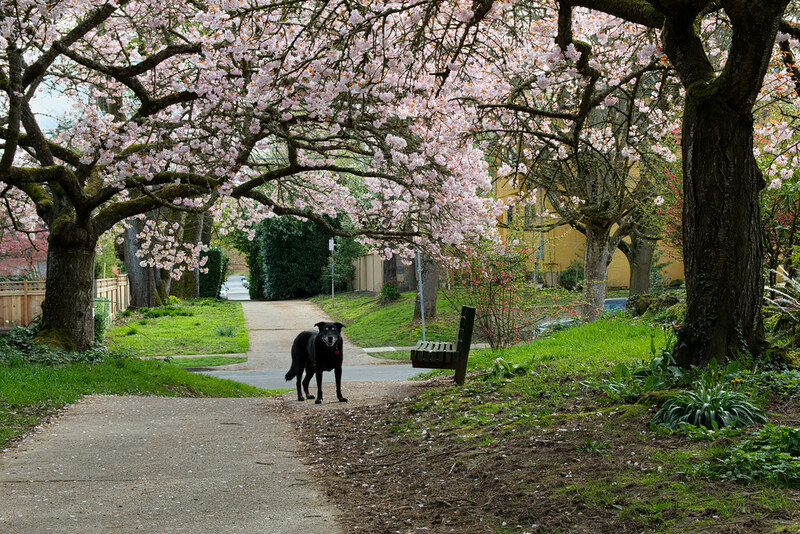 Ellie poses under the cherry blossoms on Klickitat Street after we went to the dog park (I took her leash off for the picture). The street was made famous by the Beverly Cleary books I read as a child, although her characters live a bit further east than this. The first few blocks east of Irving Park are closed to vehicle traffic (except for the handful of houses with driveways on the street) so you can walk down the street itself. 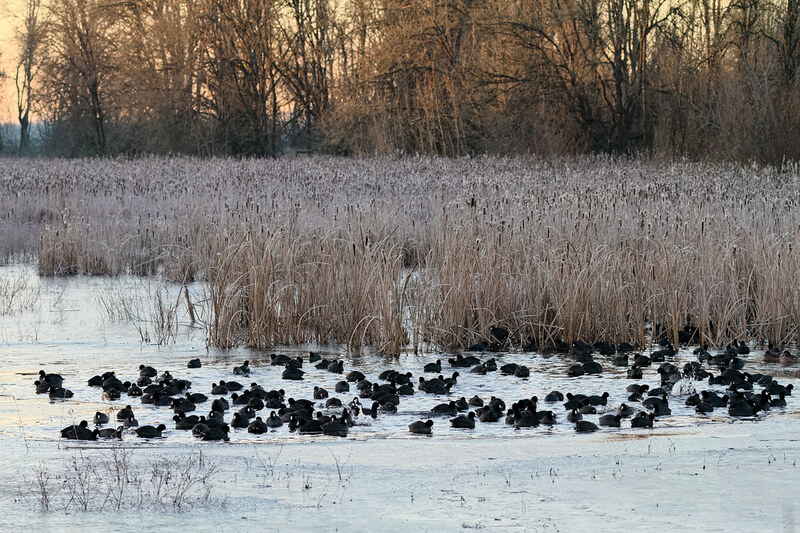 A cold snap at the end of 2014 left many of the ponds and lakes at Ridgefield frozen over, but this group of American coots was helping keep a section of South Quigley Lake open with their constant movement as they dove under water in search of plants to eat. There’s a culvert near here that runs under the road and keeps water flowing between the north and south lakes, so the water here tends to stay open longer than the other parts of the lake. The handful of splashes in the picture are from coots diving under the water, in the splash on the far right one of the coot’s legs is visible sticking up above the water. There’s also a pair of American wigeon on the far right, they frequently will try and take some of the plants that a coot brings to the surface, but on this morning they seemed content to just hang out with the coots and enjoy the safety in numbers as well as the open water. The sun was just starting to rise on this New Year’s morning, there’s a hill above the refuge that blocks the sun right at sunrise but it was just starting to crest the hill and illuminate the trees at the far side of the lake. My Tom Bihn ID messenger bag has been in daily use for twelve (and a half) years now. 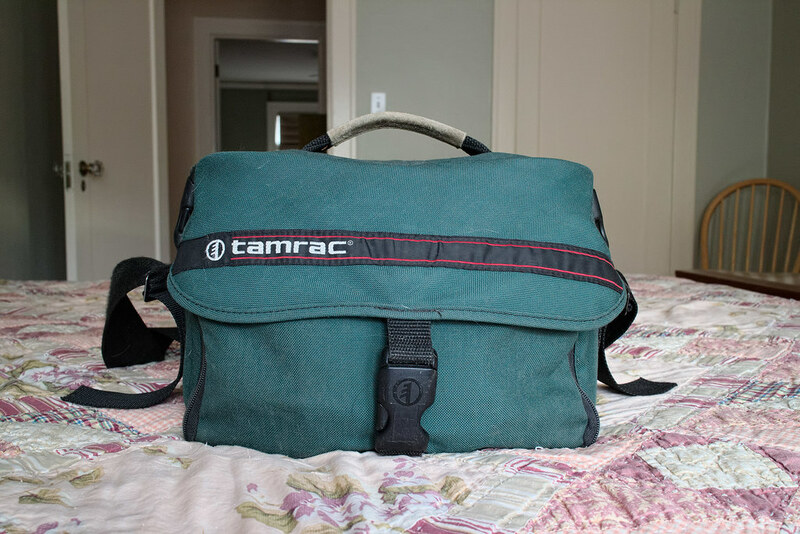 I first wrote about it in my eleven year review and it is still the bag I use every day. 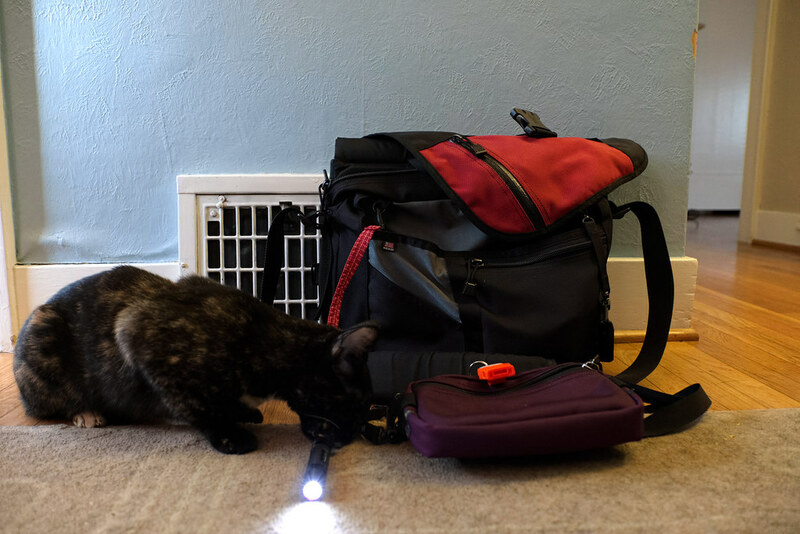 I’ve added a few accessories, most importantly a 16″ Tom Bihn key strap with a Fenix E12 flashlight attached at the end. It’s not so much for me to see as for me to be seen as I’m walking on my commute, either to or from the train when I take the MAX or in a dark parking lot on days I drive. The red color of the strap makes it easy to see in the bag, which is not true for the flashlight which sadly only comes in black. Because the strap is near the side of the bag, while walking I can reach behind me and under the flap and grab the strap without breaking my stride, enabling me to pull the flashlight out without stopping or even moving the bag around to my front. It’s also nice that the light can hang from the strap if I need to adjust my gloves or use the phone. I also added a new Brain Cell that is perfectly sized for my 15″ MacBook Pro and an Aubergine Side Effect (with a safety whistle attached in the picture) which fits in the front of the ID and adds more organization. I’m still deciding exactly what to keep in the smaller bag, or if I’d rather leave it in my backpack instead. I put a USB stick on another key strap, I don’t need one very often, but this way I always know I have one and can get to it quickly. I also have an iPad now which makes taking the train much more pleasant, and it can go in several different places. I usually place it beside the Brain Cell in the laptop compartment where it’s pretty secure, but it can also go more loosely in the front compartment or in the magazine pocket on the back of the bag (it can be stowed very quickly there, a convenience if I’m a little late in realizing my stop is coming up). I have gone back to riding the train most days which puts a lot more stress on the bag than when I drive, as it is under load during the time I’m walking to and from the train and when I’m standing because there isn’t a seat available. But the train commute really highlights why I’ve so loved this bag. It’s wide enough for my 15″ laptop and deep enough to carry the things I take everyday with room left over for the occasional bulky items, but not so large as to get in the way on the train or encourage over-stuffing (I don’t like backpacks on the train but in my opinion they are the only good solution for heavy loads). The front strap keeps the bag cinched down in a narrow profile but can be expanded so I can stuff a hoody or jacket in the bag during the spring and fall days when the temperature is changing drastically during the day. After all these years the ID is gently preparing me for the day that our time together draws to a close. The back zippered compartment where the laptop goes in particular is having issues as some of the stitching is coming out or fraying from the velcro of the Brain Cell when it’s left open. Then one day while in a hurry I tried to zip the compartment closed too quickly (the new Brain Cell sits a little differently that the old one) and one of the zippers popped off one of the tracks. The other zipper still works fine but it keeps me from just zipping both ends a bit, a little trick to quickly force both ends to tuck in well below the flap for extra protection in a heavy rain. The pad on the shoulder strap is also showing wear from heavy use. In general though the bag is in great shape so it will hopefully last me for a while yet. 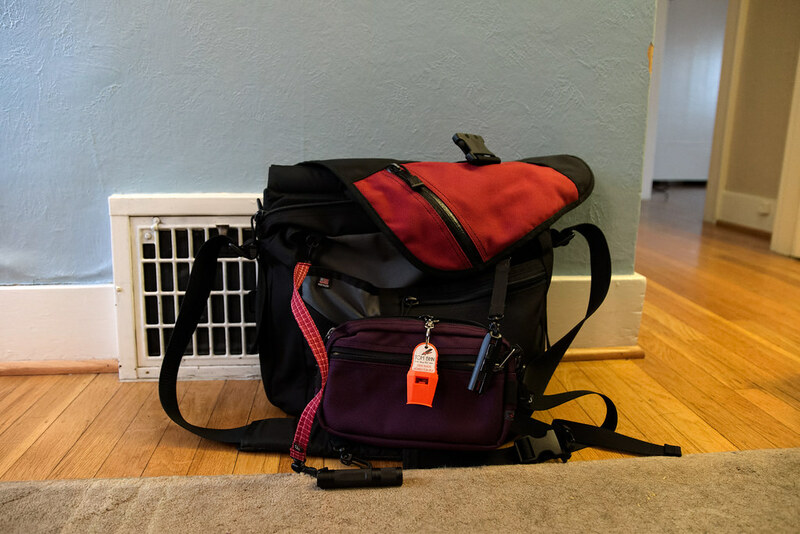 I don’t know what I’ll do when it’s time to retire the bag from every day use, as the ID has been discontinued and Tom Bihn hasn’t announced a replacement. And even when they do, since the ID has been such a perfect fit for me, no matter how nice the new design is I doubt it could delight me quite as much as the ID. I’ve been meaning to post this update for a while but resisted for one simple reason — when I’d set up to photograph an item before, our cat Emma (who hated to be photographed) would come over and photobomb the pictures (she’s the black cat in the pictures in the eleven year review). She died a few months after that review and for a while it was too painful a reminder to set up the bag for a picture and know that Emma wasn’t going to come running over to sit nearby. So it delighted me to no end when I set up the ID for a quick picture and Trixie came over and started chewing on the key strap that holds the flashlight. 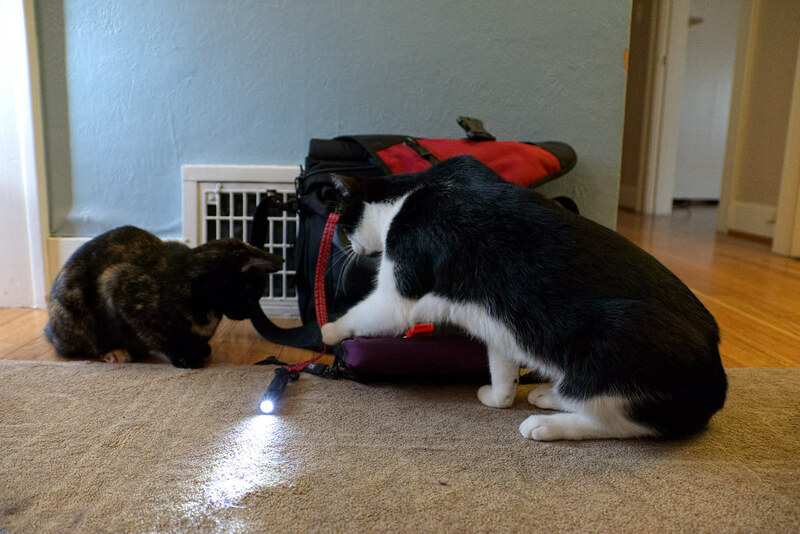 Professor Boo then came over and showed his young charge how you can retrieve the flashlight by pulling on the strap, while gently telling her not to be embarrassed, we all have to learn not to eat flashlights. I don’t know what triggered them to come over as they’re both very familiar with the bag — in fact it was one of the first things they each saw when we adopted them, Boo in 2013 and Trixie in 2015, as I brought it with me when I sat with them while they were in isolation — but it was a nice little homage to our dear departed Em. The ID is within arms reach of nearly every picture I post unless I’m out hiking or taking Ellie on a walk. It’s at my feet when I’m on the couch taking pictures of the pets sleeping on me and I bring it with me when we need to keep one of the pets in isolation (as with Sam below when he was recuperating after getting teeth pulled). At Ridgefield it’s tucked in behind the driver’s seat as I photograph the animals on the auto tour. It’s gone with me on all my hiking expeditions to Yellowstone and Mount Rainier and the like, but it stays in the hotel room while I hike. It goes with me to work every day and is sitting beside me now on the train. I’m a little shy of fifty so I’ve been using the ID for over one out of every four days I’ve walked the earth. It’s one of the best products I’ve ever purchased, in any category, so its replacement will have big shoes to fill. Many, many thanks to the team at Tom Bihn for both designing and manufacturing such a great bag. Trixie had been with us for a couple of weeks and was starting to get introduced to the house at large, but she’s wide-eyed not because of being overwhelmed at meeting the other pets (she was eager to do it, we kept the introduction slow for the benefit of her older brothers who were less keen on her arrival), but because I only had one small lamp on and her pupils were wide in the low light of the room. She is demonstrating her quick mastery of a skill often on display in our home, a cat sleeping in a dog bed. 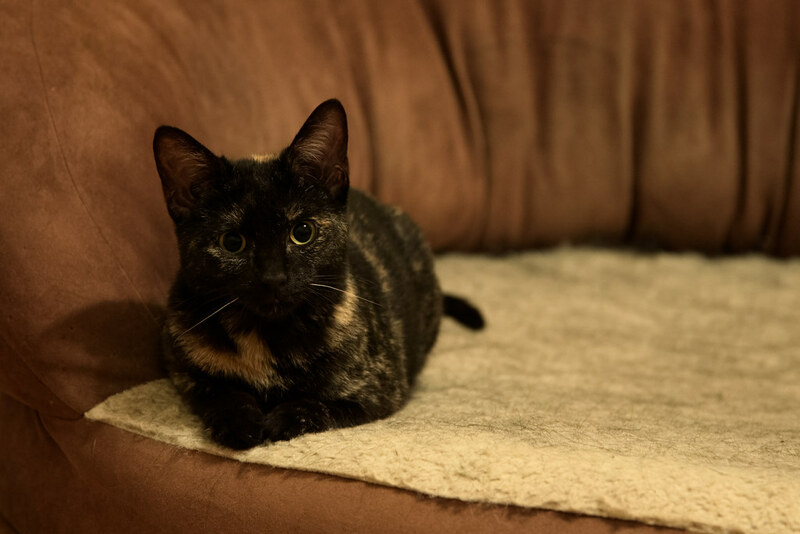 I had brought one of Ellie’s beds into the room where we were keeping Trixie isolated as Ellie desperately wanted to be wherever I was, and she and Trixie got along well from the start. Age is taking its toll on our sweet pup. Her stamina has been declining and while she still gets around pretty well, she’s not as confident in her footing as she used to be. Her hearing seems to be on the decline and she has a thyroid issue (thankfully it’s responding well to medication). At her last checkup her blood pressure was high as was the protein in her urine, the latter something we’ve been keeping an eye on for a few years, so she’s now on blood pressure medication. She had an ultrasound yesterday and thankfully her kidneys are in good shape, but there is a growth on one of her adrenal glands that might be harmless but could be the early stages of cancer, we’ll recheck in a few months and see if it’s growing. The hardest part yesterday was that in order for the ultrasound to be effective we couldn’t feed her in the morning, and food is one of Ellie’s great joys. Funnily enough she has lots of little ways of reminding you she hasn’t been fed but she won’t get aggressive or even bark, so gentle is her nature. As I got my breakfast, even though disappointed her owners had forgotten to feed her, she got excited as this is when she gets a dental bone, her favorite treat. But even that had to wait until after her test so I had to watch as her initial excitement turned to confusion and sorrow as she slowly realized her hints weren’t being taken and she wasn’t even going to get her treat. Perhaps as a side effect of the sedation for the ultrasound, or worry over lost treats, her stomach was upset all night so I stayed up with her to let her out into the yard whenever she started dancing around on the hardwood. She was feeling better by morning but I was so tired from being up most of the night that I’m taking today off. She goes back in a couple of weeks to recheck her blood pressure and protein levels. One thing that remains unchanged is her bountiful and joyful spirit. She doesn’t mind that in addition to her allergy pills she gets an extra pill in the morning and three in the evening, as we put her pills in hot dog slices that she readily gobbles down. In fact she’s trying to convince us that she also needs to be treated for scurvy, botulism, and space madness. This picture was taken in early January when we got a nice bit of snow. 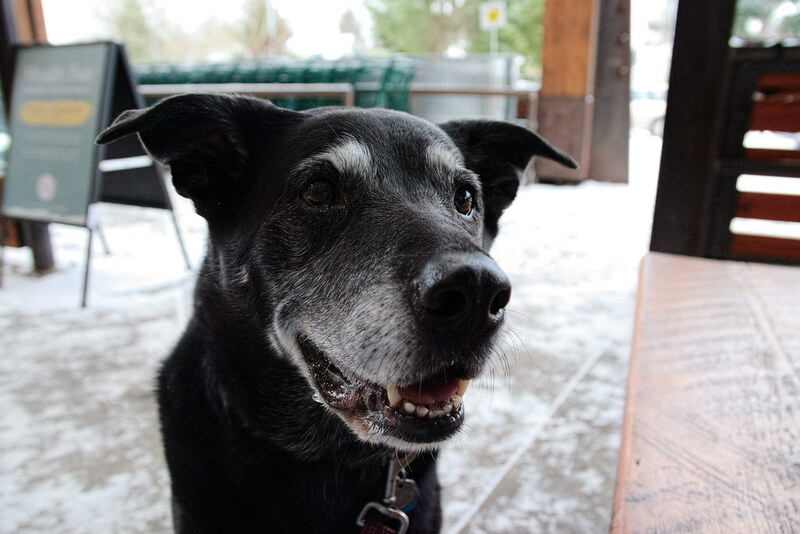 My wife and I walked with Ellie up to the neighborhood grocery store for a few supplies and Ellie and I waited outside at one of the picnic tables while my wife grabbed the groceries. She’s drooling because I kept bribing her with treats so she wouldn’t greet every single person entering the store and sniff the bags of those walking out. I’m holding the camera down and to my left, she’s watching my eyes for a sign that another treat might be forthcoming. May you have many happy and healthy days to come, sweet pup.